Happy Tuesday!! I woke up feeling 1000x better today. It’s amazing what sleep can do. 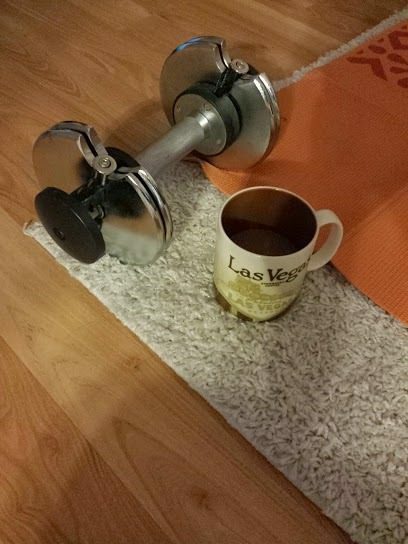 I’m going to do my strength session for March in a bit and then spend some time with the foam roller. My quads are kinda sore. You rest after a race not because of what you did on race day necessarily, but because of the 12 to 16 weeks of training you just did. You put your body through a lot over those months! It’s a lot of compiled stress / work and now it’s time to rest and recover. So, even though you may feel ‘all-right’ or even ‘good’ – you owe your body care in the form of some rest and recovery days. Yesterday I didn’t even look at my suitcase, but today I have to unpack and wash everything. Then, I have to repack on Thursday. Anyway. Unpacking reminded me of a great tip I wanted to share. 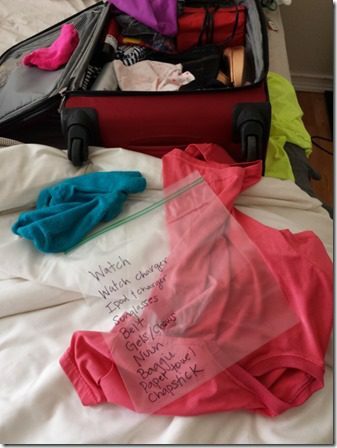 This is a good idea if you are traveling for a race but really, it is helpful and can relieve that “did I forget something?? !” feeling for any race. I keep my electronics in one gallon size plastic bag. Write all the things you need on that bag with a sharpie. That way you won’t accidentally forget a charger or something. Question: How are you doing today? Got a tip to share?? socks? My husband forgot to pack his running socks last time we traveled for a half. it was either he wear his black mid calf socks or wear a pair of my socks. It wasnt pretty. but I know he will never forget again! OMG…I love that tip. I’m a traveling for my first “away” race in three months and that tip is awesome!!! love your tips… but need to say I am drinking my morning Joe out of the same Las Vegas mug right now! !hee hee!!! have a good one!! Sore! Did a heavyduty leg workout this morning. Plus the haze is playing havoc with us. How long do you rest after a Half? How long do you wait after a Half to race again. 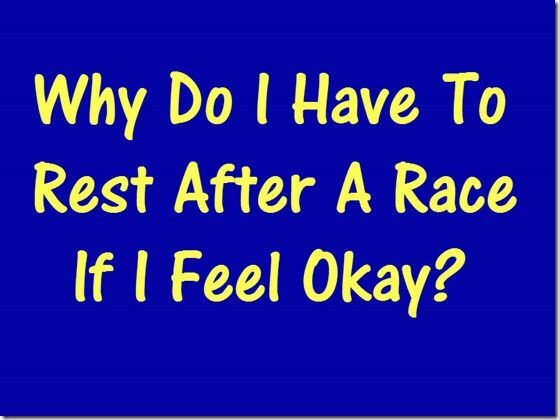 I had a 10 mile before my half that was cancelled and rescheduled for a week after my Half … Will it be OK to race a week after my Half? What do you recommend I do in the week in between? Cross and stretching? Strength? I’m so tired. I don’t get enough sleep, and I’m trying to figure out how to fit a little more sleep into my busy schedule. I write everything out..the list ends up taking a couple of days to make because I keep adding things on! Travel tip – I’m a huge fan of making lists so when I know I’ll be going on a trip I start a list of things to bring several days in advance – that way I have time to remember all of the little things I’m forgetting. love the plastic bag with sharpie tip! I swear I’m always scared of forgetting something, and usually just throwing things in my carry on or backpack for races. I’m going to try this next time! My tip: if you forget a phone charger ask the front desk! When I was away last weekend my friend forgot hers and the concierge had a huge collection (from all you poor suckers that forgot yours in the room, haha). That’s an AWESOME tip! I usually make a list and check it off, but that saves time of wondering if I remembered to pack something or not! I always make a “morning of” list to check off, to make sure I don’t forget stuff I have to use in the morning before leaving and then pack! What a great idea to use a gallon bag for that! Then everything you need is ready to go and you don’t just have to do the night before lay everything out. Totally keeping this in mind for my ½ marathon in Boston in May which will require a cross-country travel! NO forgetting anything! Oooh, great tip about the sharpie on the ziploc bag! In a few weeks’ time I’m doing the first race I’ll have to travel from home for, and this might make me a tiny bit less likely to forget something really important. Except it’ll probably be something that doesn’t fit in the bag – like my running shoes. 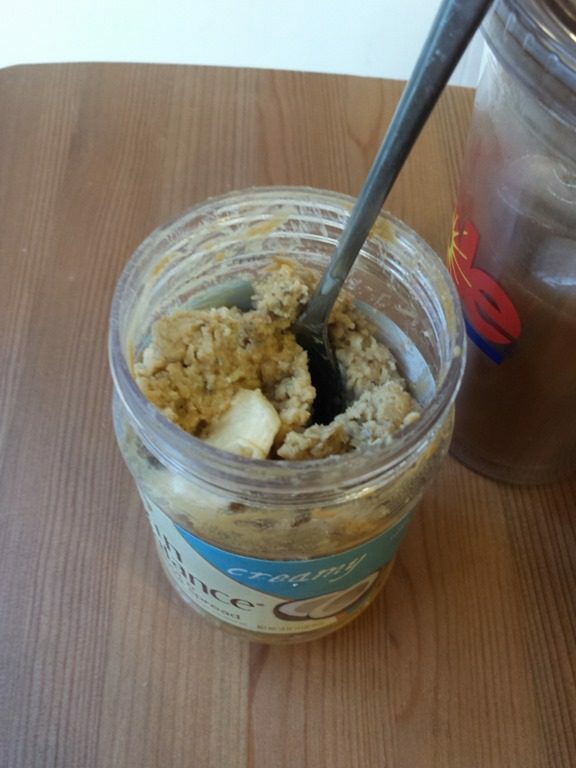 A ziploc bag is genius! I use one of my previous race bags like the ones Rock n Roll give you at the Expo to store my race gear. Oh yeah, one tip I have is ALWAYS carry tissue or kleenex for nose running or porta potty. Thanks for this comment!! I read it the evening before my first half marathon and decided to take some kleenex with me. I was so happy I did as I was dealing with stomach cramps at 15km and no toilet paper in the porta potty. 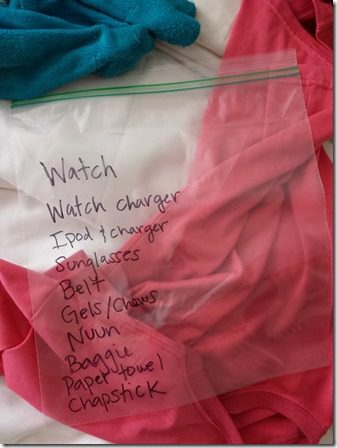 That’s a great idea to list everything in the ziploc bag. 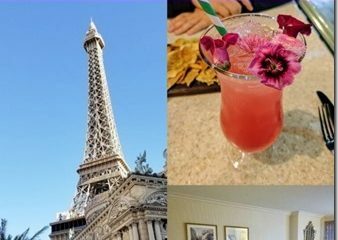 The last time I traveled, I was so unorganized, I forgot my phone charger, tooth brush and toothpaste. I’m usually not that forgetful, I swear. Loving the writing-on-the-bag idea and will surely do that in the future. I always end up forgetting something (usually the most important thing) and freaking out the morning of the race. What a great idea! Why have I never thought of this?! Thanks! 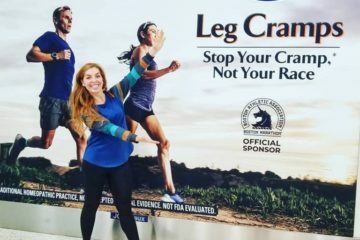 Thanks for pointing out the need for rest; I hurt myself a couple years ago because my mileage was too much for my poor shins and even though I didn’t feel terrible, I should have been resting more than I was. Paid for that by being sidelined for a couple weeks. It’s important to rest even when my brain tells me I dont have to. Thanks! Monica!!! LMAO!!! I can stare at that honey boo boo all day! hahaha. That seriously made me spit out my water. That make my day! Thanks for that! I like the baggie idea! I will borrow that. 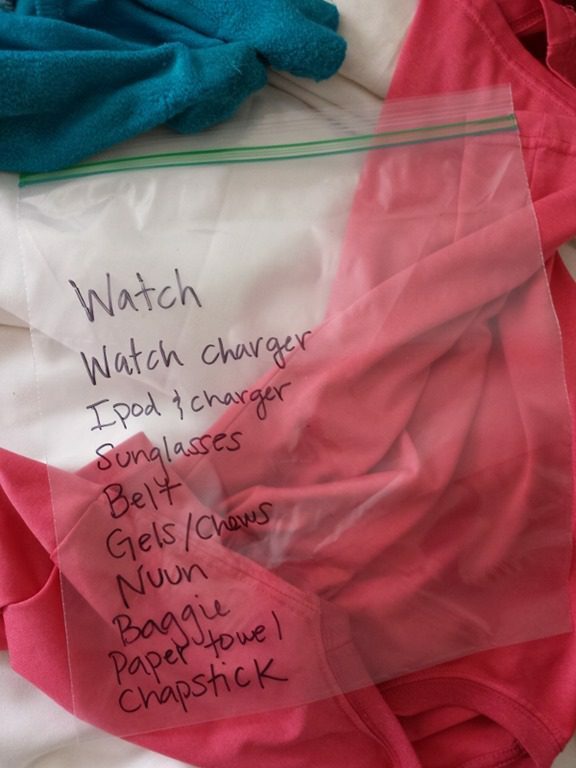 I have a bag I keep all my stuff in, but seeing a checklist is much better. BTW, I didn’t see any body glide? Thanks again for the laughs! I actually don’t really use body glide – isn’t that weird?! I bring grocery plastic bags for that too! I don’t think my clothes would fit in a gallon though. Smart idea. This is similar to what I did for Ragnar. I put the list inside, though, but this is way smarter. That’s a great idea writing on the Ziploc bag! I’ll have to remember that! Me too. I know it’s bad, but I can’t stop… it’s harmless, right? Thanks for the great tips! I love the idea of writing everything you need right on the bag. I’m a list person and usually have about 8 lists of things I need to remember floating around. This helps! I do the same thing! Maybe if I actually write the list on the bag that will help. freaking out a little. i think i’m getting a cold but i’m drinking green tea and praying it goes away before the NYC Half on Sunday. Yikes! 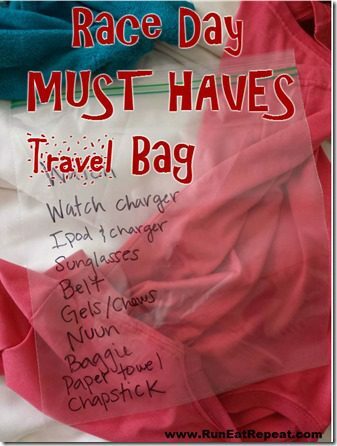 LOVE the sharpie on ziplock checklist! Thanks for sharing.